The Kitchen is a trade paperback billed as a “reimagining” of the mob novel for a new generation. The question is which generation? It’s hard to imagine millennials who read graphic novels will flock to this ultra-violent story really more suited to the baby boomers who may possess post-traumatic memories of having lived through the bad old days of New York. As anyone who lived in New York then knows all too well, it truly was the modern nadir of our beloved city. The Son of Sam serial killer was running around blasting away at lovers in cars, entire neighborhoods made a sport of looting their local stores during a major blackout, and the subways gave every appearance they were unlikely to make it to the 1980s. The city felt ungovernable, like it had been handed off to local thugs who at least kept a lid on some of the crime. This is where The Kitchen enters the picture—it portrays a New York neighborhood that is largely run by a ruthless Irish mob in cahoots some of the time with La Cosa Nostra, the Mafia. 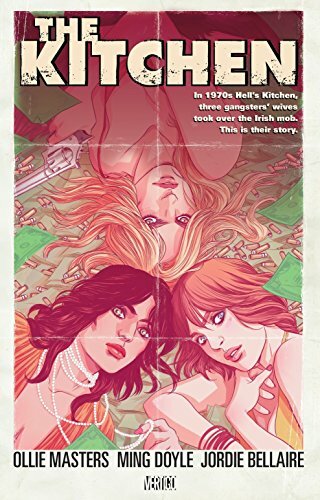 The Kitchen is the story of three Irish wives who take over the local mob when their husbands go to prison. The ladies step in with a brutality that makes one wonder how much worse things could have been when their husbands were running the show. The tough-as-nails dames beat and murder those who cross them whether they are mob associates or friends and family. No one gets a free pass. The violence and vulgarity is non-stop as the ladies try to prove they are every bit as tough as their men. Their savagery may help them keep people in line (although barely because it seems like someone is always crossing someone) but it’s not much fun to read. There is not a character in this novel one can root for. There is a ham-handed, soap operatic attempt to explain the ladies’ violence on their equally cruel, psychotic fathers, but that brief storyline feels as hackneyed as it sounds. The artwork by Ming Doyle is exemplary as long as you want to see brains being blown out and blood flying. It’s good, but the subject matter is hard to take. I’d give this one a pass even if you pine for the days when New York was more “real.” This kind of real is something that is not in the least missed.